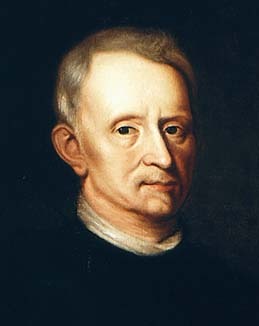 Robert Hooke was perhaps the single most influential and experimental scientist of the 17th century. His interests ranged from physics and astronomy, to biology, chemistry, geology, architecture, and navel technology. He collaborated and corresponded with chemist Robert Boyle, and scientists Isaac Newton and Christian Huygens among others at that time. He is probably one of the most neglected natural philosophers of all time. The inventor of the iris diaphram in cameras, the universal joint used in automobiles, the balance wheel in a watch, the originator of the word 'cell ' in biology. Hooke is best known to those who study elementary Physics through Hooke's Law: 'The extension of a spring is proportional to the weight hanging from it.' Most people have never heard of Robert Hooke. From the publication of his 'Micrographia' (the first illustrated book on micorscopy), to his work on clocks, springs, gases, his inventions, and idea's on fossils, weather, gravity, and light. Robert Hooke has helped to shape our world today. On July 8th, 1860 Hooke formed the experiment of glass vibrating in 6.4.8 places. This was done by putting flour on a glass plate, and bowing the edge of glass. The experiment states that Hooke oberved that the motion of the glass vibrated perpendicular to the surface of the glass, and that the circular figure of the flour changed into an oval one way, and the reciprocation of it changed it into an oval the other way. This phenomenon was rediscovered by Ernst Chladni in the 18th century. Its importance is that it influenced Faraday in thinking about lines of force in magnetic and electrical experiments. Hooke was quite acquainted with the properties of sound and had already experimented with sound amplication through the use of shape and structure. He understood that sound was made up of beats of air and had invented an ear trumpet to assist hearing. He knew also that sound could travel along a wire mechanically.